Today was the first day of the, 33rd annual, Copa del Rey, one of the Mediterranean’s largest regatta’s. I am sailing onboard Robertissima as tactician. Robertissima is a 72′ Vrolijk design IRC yacht. There are four others similar to us in our class. The Copa del Rey has 11 races on its schedule this year, with racing Monday through Saturday. Wednesday we will race a “coastal” race, which really means one long race that day, while all the ether days we races two shorter races. Today’s conditions were very typical of Palma, sunny, hot and moderate sea breezes. The first race started at 13:10 with 10 knots from the south. We had a good start at the right hand side of the line but the left side of the course was better. We could never get over to the left fully and ended up 3rd. Shockwave won and Bella Mente was second. Shockwave is the lowest rating boat in our group and gets about 1 minute of handicap time per race. They are about the same speed as the rest of us upwind but a little slower downwind. 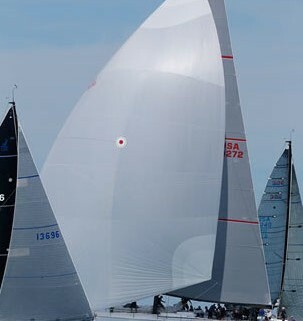 The second race was started in 12 knots of wind still from the south, Bella Mente and Robertissima were over the start line early and had to restart. I have to take responsibility for that on our boat. We got in a battle with Bella Mente for the left end of the line and I didn?t manage the situation well. With the race course fairly strongly one sided..left…neither of us could get past the others and we finished 4th and 5th respectively. Meanwhile, Alegre, who finished last in the first race, was well out in front and won the second race. Shockwave sailed well again to get second and lead the series after day 1. Tomorrow we continue with 2 races. The forecast is for a bit less wind than today. I have spent the past three months decompressing from a difficult Americas Cup for me. Sometimes things go well and you are oblivious to those struggling. Fortunately, my previous America’s Cups and Around the World campaigns have been above average and ultimately very satisfying. This time was a struggle. We had early technical set backs which burned precious time. We were on the wrong design path and we waited too long to acknowledge it and convert. The result was a painful last 6 months as reality hit us squarely in the face. The tragedy of May 9th was the worst sailing disaster I have been involved in and something I will never forget. Needless to say, it was a stressful and hugely disappointing time. After a couple of months away from it, I feel rested, but I have that lingering frustration that goes with a poor result like that. I am sure the cure is to move on to a new challenge and I am open minded as to what forum that me be in. For now, I am looking to have some fun in sailing. I have been invited to the inaugural Star Sailors League (SSL) Season Final. When I explain this new event, you will see that I really have no business racing in it. The concept is that this is a league for the top sailors in the world who are ranked through the competitions they attend during that year. At the end of the year, there is a final championship with prize money. This year, the Final is in Nassau and there will be 18 competitors racing for a total purse of $200,000. They are the highest ranking sailors in the World plus a couple of wild card invites. You can check out the participants and the results at www.starsailors.com. SSL is the creation of Swiss Star sailor Michel Niklaus. His passion for the class and this event is impressive. The SSL team are making a huge effort to run a top quality event. They have a team of 30 people doing everything from television production, to GPS tracking for live internet tracking while we race. SSL are handling everything logistical with the competitors presence here. It seems to truly be a first class operation. I am heading into the event skinnier than ever not to mention I haven’t sailed a Star in 4 years. Logically, a little humble pie seems to be on order for me. However, I love Nassau’s wind and waves and have raced here plenty over the past 30+ years. I do have one of the best crewing for me, Austin Sperry. Austin, aka Hoss, came to Athens to help Phil Trinter and I train for the ’04 Olympics and then he went to the ’08 Olympics, crewing for John Dane. So if I have a prayer out there this week it is due to Hoss. So its time to get back to basics and enjoy some Star sailing in the best place on earth to sail! Magnus Olsson was a giant bottle of “Positive Attitude” that you could pour on anything and make it shine. For Magnus it wasn’t a matter of the glass half full or half empty. The glass was just full all the time. His personality and enthusiasm were magnetic. He was the center of gravity of every boat, every meeting, every project. From heads of state to children sailing optis, Magnus could hang with them all. He is one of the very few people I have ever known who everyone liked. It is very sad to lose a guy like Magnus. Irreplaceable…. most definitely one of a kind, a legend! But it is fair to say that few, if any, got more out of their time on this planet than Magnus Olsson. For those of us who were lucky enough to have shared part of his life with him, we are blessed. Thank you, Mange. We are all smiling thinking of you! Just a quick update from down here. The Artemis Racing team is based in Auckland this week for training and attendance in America’s Cup meetings. Auckland is approximately 450 miles north of Christchurch, the site of the large earthquake of February 22. No one on Artemis Racing was involved directly or injured in the earthquake. Artemis Racing extends its sincere condolences for those who lost loved ones in the disaster and sympathy for those who are currently struggling to get their lives back in order following this natural disaster. It was Mid December when I last wrote an update. No racing has taken place for Artemis since the RC 44 regatta in Miami but a lot has been going on with regard to our America’s Cup project. I was recently in Valencia for a couple of weeks working with Juan Kouyoumdjian and our design team who are based there. We also had a team meeting that lasted three days. I arrived in Auckland today for a week to follow two issues; 1) ACRM meetings to discuss the aC72 and AC45 class rules, new racing rules of sailing, logistics around the World Series events and the SF venue and 2) to test sail the prototype of the AC45. The meetings went well today. Unfortunately the sailing didn’t. Our team capsized in the AC 45. It wasn’t even a spectacular wipeout at 30 knots. Rather they were sitting head to wind, taking a break after the three hour training session and repairing something on the roller furler. The boat got hit with a gust from about 10 degrees off to one side and the boat slowly rolled over. No one was hurt and the boat was back at the dock within two hours. There is very little structural damage to the wing but a lot of the “skin” of the wing came off. Our team will help ACRM get the wing repaired and back out onto the water asap. A cyclone is approaching Auckland and is due to hit later Wednesday so it will probably be after that when Artemis can get back to sailing the Prototype. The team are going to make a “playbook” on the capsize. Yes, even in a unfortunate situation, there is a lot to learn. Hopefully if this happens again, we will be able to right the boat without losing the skin. One thing for sure, it was good it was a 72 footer capsizing today. Simultaneous to the activities down here, Terry Hutchinson and part of the Artemis Racing team are in Oman racing the first Extreme 40 event of the year. This is a very nice reward for a lot of hard work by our team to up-skill in multihulls. Our team has put in a lot of hard work to get up to speed in multihulls and have been there training for almost three weeks. I just had to share this clip with old friends in the America’s Cup world. This video clips and interview were done with my dad prior to his untimely death in 1989. He would certainly be thrilled and amazed that, yes in fact, the America’s Cup IS coming to San Francisco Bay, and it IS being sailed in fast catamarans! Too bad he is not alive to share in all the excitement. He would love it all. I flew in to Nassau today largely to see one person; Sir Durward Knowles. The Star Western Hemisphere Spring Championship will take place here this week and 32 teams are here training. It means a lot to Durward to have the Stars here in his hometown. Durward is the Commodore of the International Star Class. He is a Gold Medalist, World Champion and a great man. He is a hero in the Bahamas and noted more for his charitable work than for his sporting accomplishments. Durward took me into his home in 1982 during the Springs and hosted me and my crews many times since. He is a great friend and mentor. I am unable to defend my title here this week due to other commitments, so I was planning to simply stop by for a visit but then had the unexpected pleasure of being asked to go for a sail. Andrew Campbell is out in Long Beach coaching the CISA clinic so his crew Brad Nichol asked me if I wanted to go out for a little tune up. So I did. Nassau is my favorite place in the world to race. The wind the waves, the crystal clear water and warm temperatures all combine to make this an intensely exotic venue. It was blowing 15 knots from the northeast today. The waves were moderate and the sea was warm as always. Surfing back toward the yacht club I was thinking back to my first sail here 30 years ago and how that downwind ride never changes. New construction never ceases on Paradise Island and the tourists have trampled through the hotels. But no one can change that beautiful sea and wind. So, all in a day…. I spent time my good friend and felt my favorite wind and sea. I feel pretty lucky. Tomorrow, at 0800, I am off to Geneva. I dialed him back and learned that he needed a helmsman for the fleet racing portion of the event who is qualified as a category 1 sailor and willing to make the trip to the UAE during the entire week of the Thanksgiving holiday here in the states. It took all of two minutes to get the support of my wife “Mrs Peaches” (more on that name later), so I jumped at the opportunity. Now… I have sailed with Paul before on John Kilroy’s Farr 40 program, so this was not a total cold call? but why me? in this amazing event 8,500+ miles from home? Let?s be fair, I am not out sailing on a daily basis these days. And as far as Paul Cayard goes, I presume I am like most other sailors… more used to reading about him sailing around the globe or keeping up on his Volvo or America’s Cup email updates rather than fielding phone calls from ‘the man’. Anyway, on Saturday, November 21st before Thanksgiving I was off to the Dubai, passport in-hand, ground transportation instructions and a target weight for the morning after arrival crew weigh-in. Having no cell phone or email reception the next morning, I found my way down to the dock where I saw an amazing line-up of these RC44’s. The shore teams were already populating the dock that morning with work lists and projects that needed to be done. The boats are a true sailor?s machine, designed by Russell Coutts and outfitted with the best equipment and pro sailors available on the planet. So let’s see… I am in the office Friday in Los Angeles and Monday I am standing on the dock in Dubai ?not bad. A 1:00 pm dock start for starting practice that day got things rolling quickly and I definitely felt a bit rusty getting plugged into this great team of sailors. Hopefully, I would be a quick study as I was asked to play tactician while Paul drove the match race practice drills! After starting drills I was able to get some driving time in preparation for the fleet racing series later in the week. I can tell you that these boats are as hard to drive as they are fun. If you are off the pace, guys like Marco Contant and Robbie Naismith are quick to let you know your deficiencies and keep you focused! After a couple more days of practice, we were ready to begin the event with the match race portion starting on Wednesday. We had a great series finishing 3:1 in light and shifty conditions but were penalized for an incident causing damage which deducted a couple points from our overall match race series score. Somewhere along the line Paul had written a daily report about my nickname “peaches”, which apparently clogged his email with responses, for which I apologized to him about… “Sorry about that Mr. Cayard”. But for those interested, approximately 24 years ago I got crossed-up with some guys named Craig Leweck, Kimo Worthington and Billy Worthington doing an IOR boat delivery from LA to San Francisco for Big Boat Series, and yes, all I brought to eat for the entire six days at sea was Del Monte canned peaches. They starved, I was fine. End of story (P.S. they also thought they were pretty cool back then). Friday dawned, the first day of fleet racing, and I was psyched to be behind the wheel of Katusha and give it my best. The conditions remained fairly light requiring major concentration and feel for the boat. It also reminded me that on every level, sailing boils down to the basics; getting line sights, judging the wind strength for boat set-up, checking current, sailing upwind to check speed, keep your head out of the boat, look for pressure, etc. But like all competitive classes it seems the whole fleet arrives at the first mark at the same time regardless of how good you start and how smart you sail. Clear air and positioning were key and we did a good job of always being in the game with finishes of 4-9-5-6-3-7-8*-10-7-4 (the 8* representing double points for our 4th place finish in the distance race, which was a tough race and a great experience in itself). It was great sailing with Paul and all the guys on Katusha, I was truly honored to join them in Dubai; the whole event was very organized and professionally managed on and off the water. We had such a good time and I learned a lot. Departed the UAE Monday morning after Thanksgiving and after gaining 12 hours, I arrived in LA noon the same day. Tuesday I was back at work reflecting on what seemed like a dream. I imagined it would be akin to an amateur golfer with a real job, being invited to play a scramble at the Masters at St. Andrews with the likes of Michelson, Woods, Furyk or Westwood; and then after a week in that environment returning to the office with just the reflection of an opportunity seized… and it all started with a phone call on a late October night. When Bob isn?t fielding dream phone calls, he is a Project Manager in the commercial real estate industry.